Yours is the 1359614 th visit. In 1993, a spiritual surge commenced when a wave of Light shone upon countries around the world. For perhaps the first time in the history of our world, people of so many diverse nations were provided the rare opportunity to see and hear an enlightened Master divulge the secrets of eternal life. 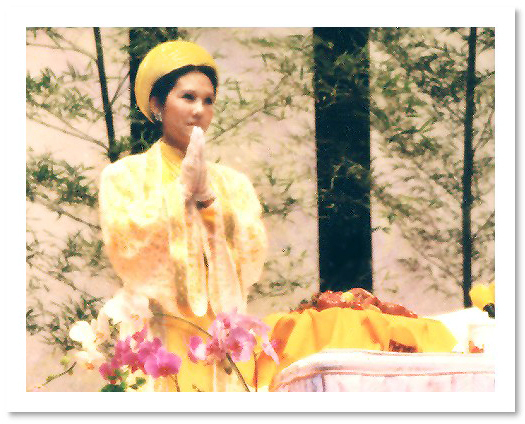 From March to June 1993, the Supreme Master Ching Hai and Her assistants flew thousands of miles to travel to twenty-four cities in sixteen nations to share the message of Truth with people around the world. Master gave 28 free, grand public lectures, and more than thirty talks to old and new initiates along with countless interviews. These lectures and informal talks granted countless sentient beings a chance for deliverance and an opportunity to put an end to their wanderings within the lower spheres of the universe. Today, five years later, we happily remember this world lecture tour that shook the universe to the core and won praise and respect from even God and the Saints. We have compiled into 6 books for you two of the interviews and the 28 formal lectures delivered by Master and the many reports composed by the news group accompanying Her on this tour. In this issue of the News Magazine, initiates who participated in the multitude of tasks on the world tour are delighted to share with you their recollections and insights that they gained from their work experience. In early 1993, after the International Seven-Day Retreat in San Di Mun, Pingtung, Formosa, Master moved to Laiyi Center, Formosa and stayed there for a period of time. In peace and love, residents and lay disciples as well as animal "disciples" spent a wondrous time with Master. Meanwhile, preparations for Master's world lecture tour were under way. A journey that would greatly uplift the world's spiritual awareness was about to be launched. There were very few fellow initiates at many of the scheduled tour stops and it became necessary to have an entourage comprised of fellow initiates. This group would accompany Master on the World Tour in order to make preparations for the lectures at each of the venues. Through God's marvelous arrangement and Master's traceless blessings, fellow initiates who were suited to this task emerged one after another after undergoing a period of spiritual purification. 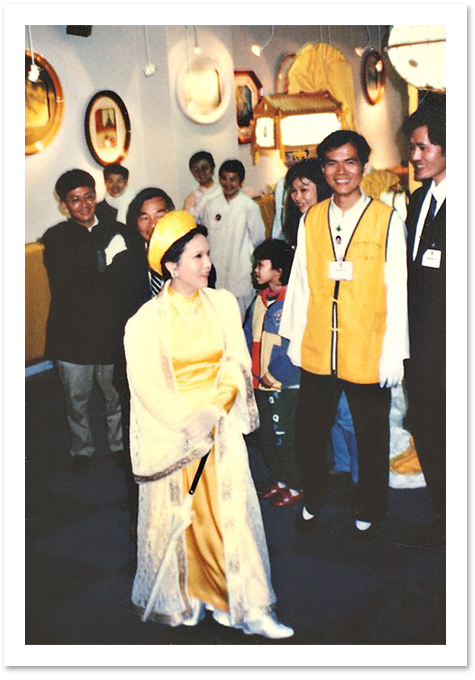 On February 28, 1993 Master bestowed another grand public lecture on Formosa, an island where She had spent ten years and had left Her graceful footprints and love in every corner. On the day of the lecture, Master's artistic works were displayed in the lobby of the hall. The frames for the paintings were designed by Master and hastily made by fellow-initiate carpenters only the night before the lecture. These frames deviated from the traditional rectangular shape and varied from heart-shapes to elliptical, hexagonal, etc., according to the spirit of the paintings. With visible and invisible approaches, Master sparked the wisdom of Her disciples, forcing the fellow-initiate carpenters to surpass their limited confidence and abilities. Visitors marveled at the congruity between the paintings and their frames, and the perfect composition of patterns and colors. Master's fan painting was also displayed, and the rich Zen themes inspired people to ponder the deepest meanings of spiritual practice. The delightful colors and harmonious designs touched our deepest innermost being. At midnight, initiates gathered to listen to Master's earnest teachings and drink in Her magnificent presence one more time before She left. And the next day, Master and the entourage set off on this unprecedented journey. Master's artistic works were also taken along on the Tour and became silent partners as they played a wordless, although crucial, role in the sharing of Truth.